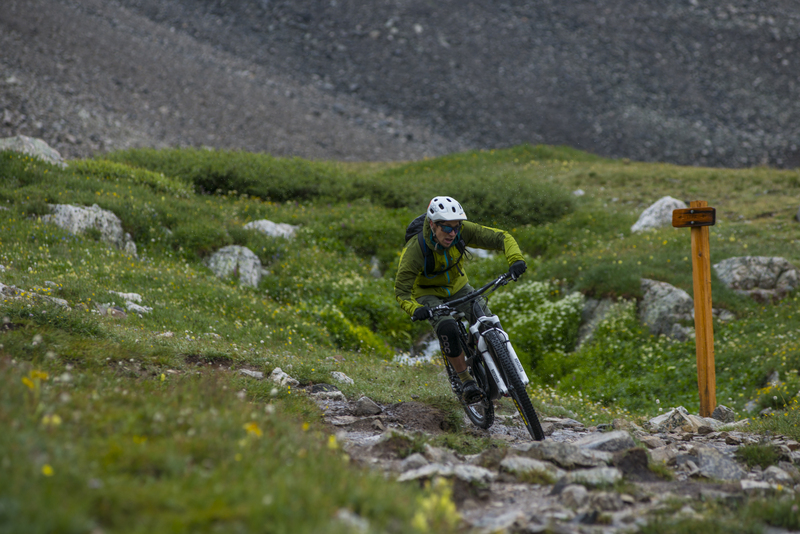 18 of Colorado’s 14,000ft peaks are not in restricted wilderness areas (which prohibit the use of mechanized vehicles) which means they’re on-limits for mountain bikes. All the 14ers were skied in one winter by our good friend Chris Davneport and they’ve all been hiked by many throughout the years. No one has ever biked them. 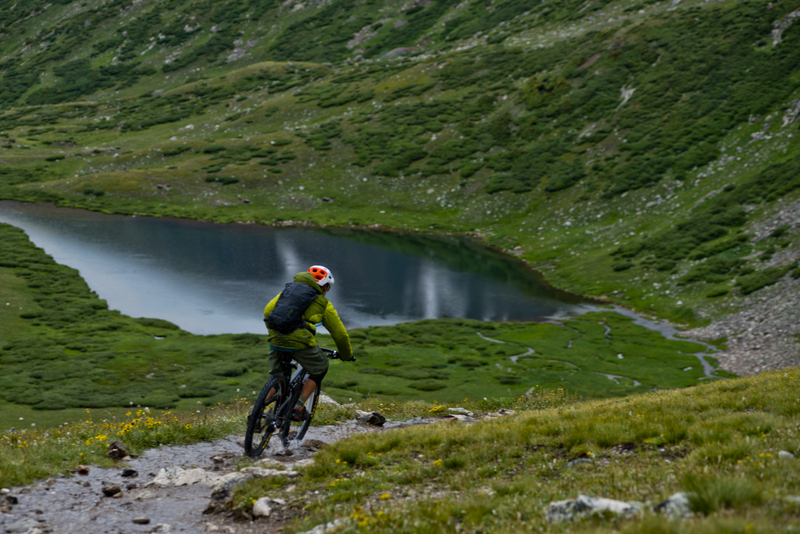 We plan to be the first people to bike all the legal 14ers and invite you to follow our journey! Whit is an athlete and artist based out of Aspen, Colorado. 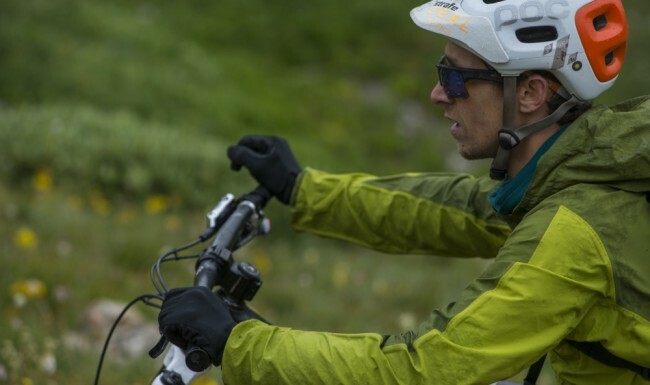 He’s known for being an unstoppable ball of positive energy and a beast on a bike or skis. He has superhuman speed and style going down and strength going up. His dog Bromley (aka Brom-masty) will tell you he’s also one of the nicest dudes you’ll ever meet. Ian is a photographer and writer and a partner in a unique creative agency called The Public Works. If he’s not out getting amongst it somehow he’s probably in an airport or tending to his backyard chickens or building something for his house in Denver, Colorado. The project started with a rumor. There was word floating around that Mt. Elbert was actually a good bike ride. 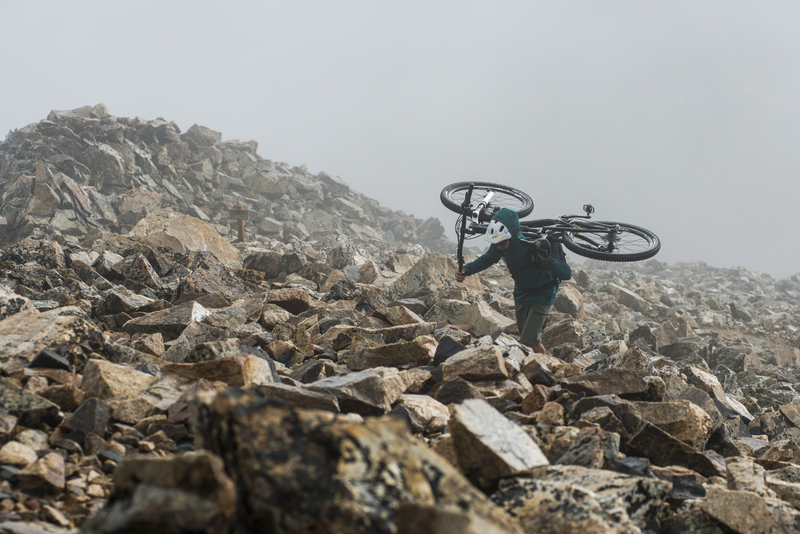 We were skeptical, picturing a mountain of unridable scree and hours of hike-a-bike, but we decided to go for it anyway. 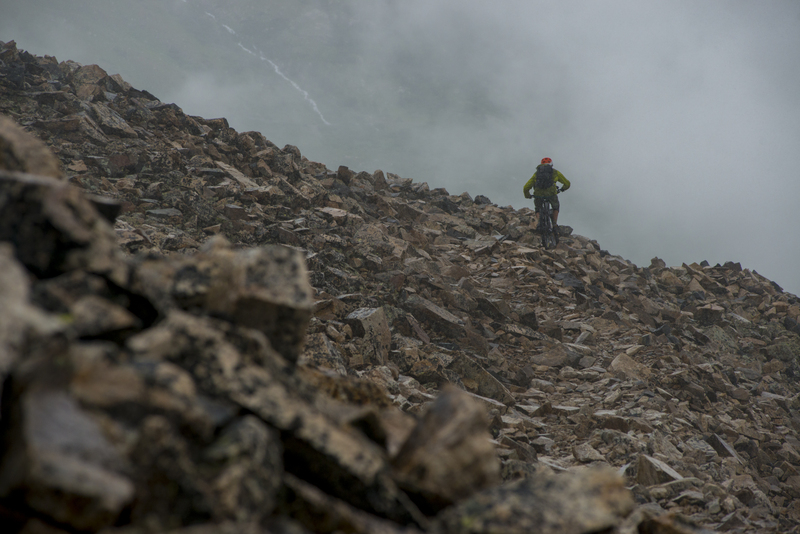 We weren’t too far off with our predictions of unridable scree but we didn’t have any idea how amazing it would be freeriding through alpine tundra at 14,000ft with the Elk Mountains spanning below us. 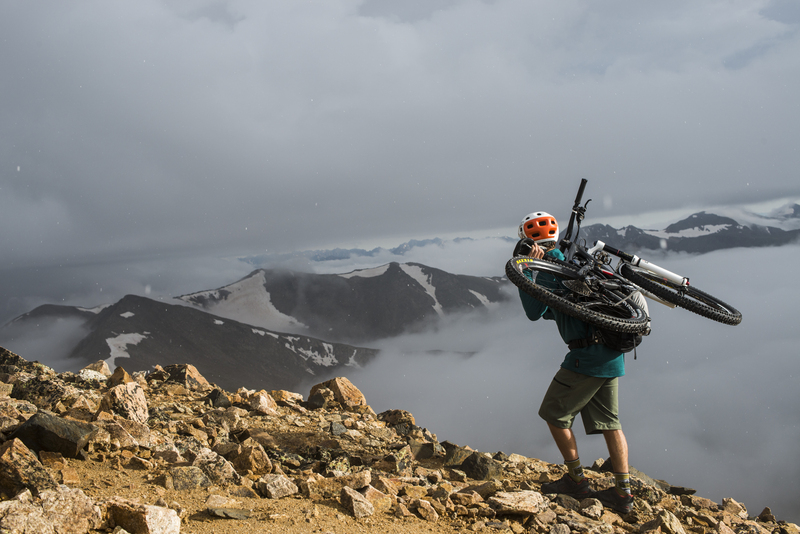 It turned out to be the most fun we had on our bikes all summer. “You don’t know till you go” has become the motto of this trip. 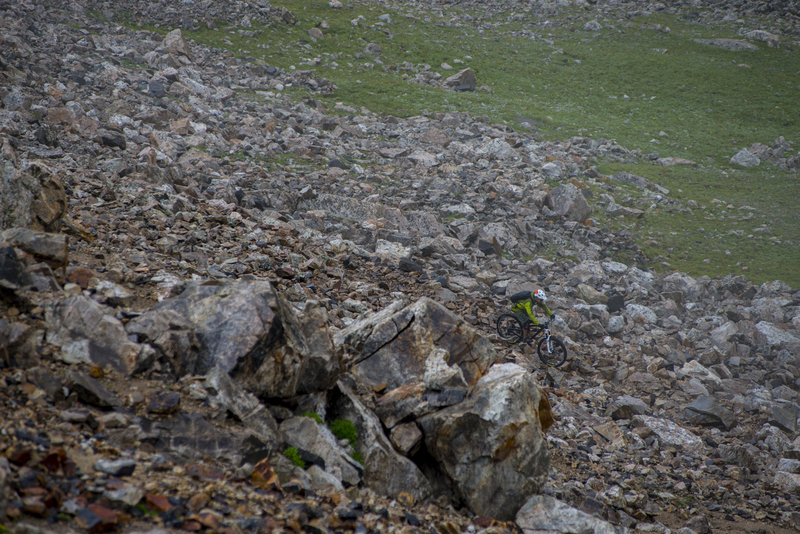 Each peak is different and since this hasn’t been done before, there’s no information on biking most of these peaks. By biking these mountains we’re able to add an element of exploration and uncertainty to amazing places in our backyard that we might otherwise discount as “already done” or not as appealing. Every day is a surprise. We sit around the campfire the night before joking about how brutal it’s going to be or firing each other up with premonitions of incredible riding. Usually the next day brings a bit of both but it’s always an adventure. 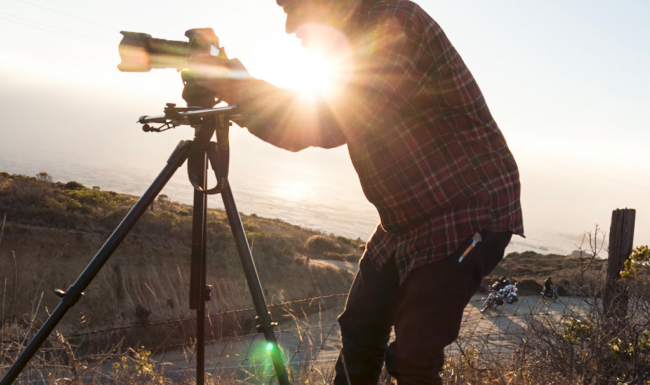 The project is just a good excuse to ride bikes and shoot photos in amazing places in our own backyard that we might not otherwise motivate to get to. Our plan was to bike 3 peaks: Democrat, Lincoln, and Cameron. They share a ridgeline but the saddle between each is more than 300’ so they’re considered separate named 14ers. It looked big but definitely doable (another trademark phrase of the Project). The only real cause for worry or hurry was that NOAA.org called for thundershowers in the early afternoon so we had to do an extra early start. The possibility of thundershowers is a constant in Colorado during the spring and summer so we didn’t think too much of it. 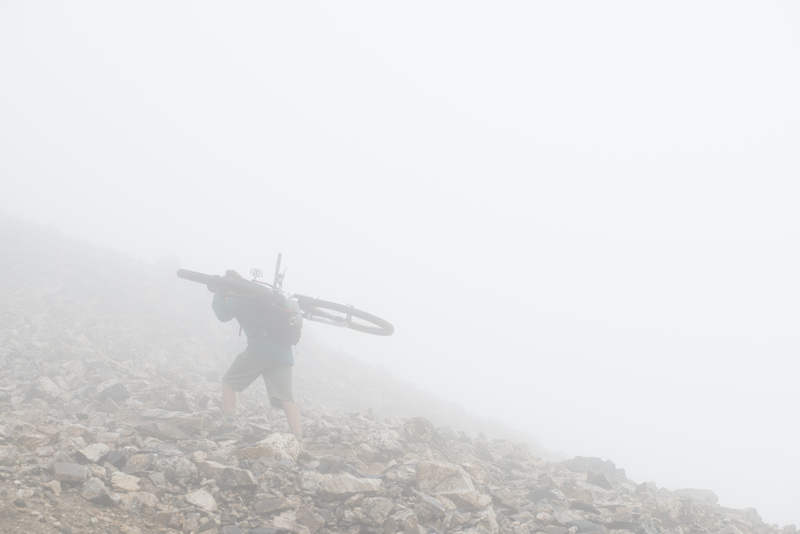 We headed into the fog with our headlamps on fully aware that we might be chased off the mountain by weather. We knew we had an easy out if things got nasty while we were on Democrat and figured we’d reassess before we headed out onto the ridge to Cameron and got too committed. 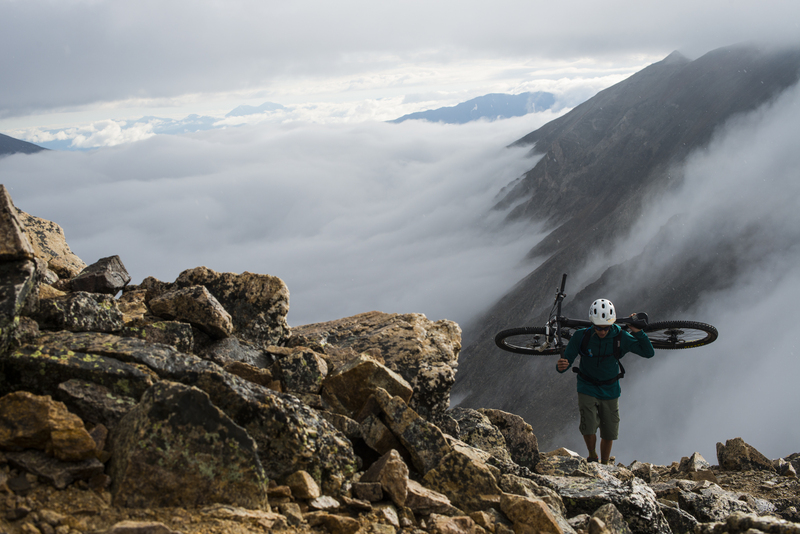 Hike a bike is just part of the project… It’s all part of the adventure and more than worth it for the descents. As we broke above the fog layer, we got to enjoy a few solid moments of beautiful sunshine before the snow. In moments we went from basking to freezing. The warm rays disappeared without notice and were replaced by swirling spindrifts. We put on the few layers we had and made the last summit push. Too cold to savor, we scarfed down a quick snack and jumped back on the bikes. As unridable as it looks, the scree was pretty fun. 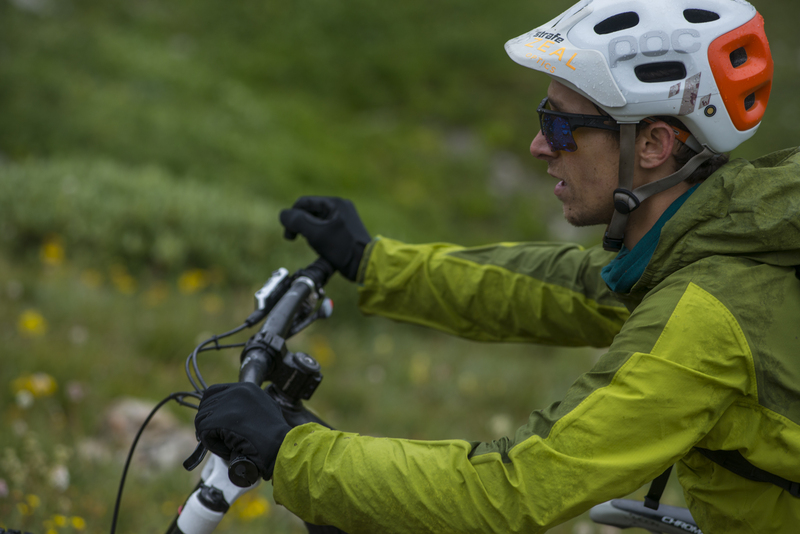 The new 6×6 bikes handle way more than you can expect and the game becomes picking good lines and trusting your suspension. However the steep technical riding gets considerably less fun when you can’t feel your fingers. When we hit the junction to head out onto the Cameron ridge it was still snowing and heading down seemed like an obvious decision. We punched through the dense cloud layer and emerged into a lush green world that felt more like the Scottish Highland than Colorado. 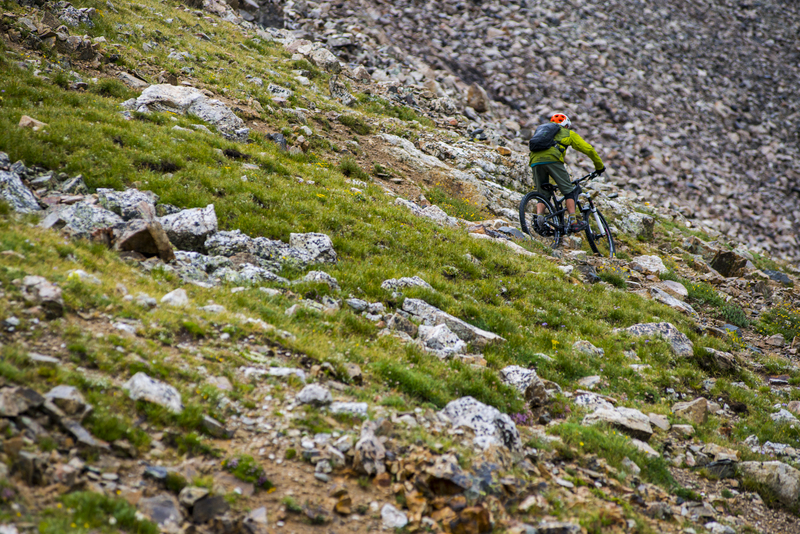 The riding, while still technical, had more rip-able sections and Jake the Dog’s energy was infectious. It was one of those Murphy’s Law situations where as soon as we made the obvious (at the time) decision to head down out of the snow and sleet, it cleared up. Moisture still filled the air but we were able to see the summits of all our objectives for the day. Turning around is always the hardest decision and often seems obvious in the moment. However, we weren’t too discouraged by our decision even when the weather cleared because we were having too much fun and we were already excited to come back a different day. Even though we planned on climbing 4 peaks and summiting 3 (The summit of Bross is private property), we chalked the day up to a success. We got some beautiful imagery and another experience in the mountains.Jake the Dog ended up following us all the way to the car and hung out with us while we ate some food and relaxed for a bit. He then ran next to the truck all the way back into Alma.